This private walking tour will be exclusive to your party. With your very own photographer, you’ll explore New York’s most exciting locations and capture the experience in beautiful photographs. 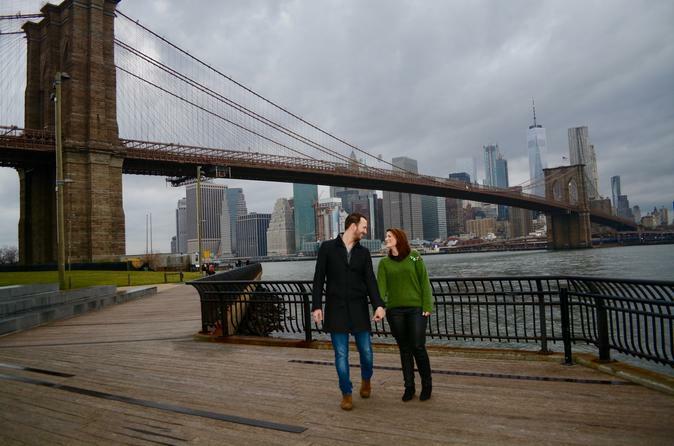 On this tour, you’ll start in SoHo, walk over the iconic Brooklyn Bridge and stroll around popular Brooklyn neighborhoods. You bring the memories home at no extra charge! We will start the tour in SOHO. Initially settled in the 1600’s, the area features cast iron buildings, cobble stone streets and art galleries. SOHO is historic, picturesque and uniquely New York. You will explore and be photographed for approximately 15 minutes, before our only subway ride, two quick stops, to the Brooklyn Bridge. You may be photographed on the train, if desired, and offered a quick tutorial on navigating the subway - helpful information for the rest of your holiday. DUMBO, (Down Under the Manhattan Bridge Overpass): DUMBO is not quite Brooklyn brownstone and not quite Manhattan glass condo. With its exposed Belgian block streets surrounded by both the Brooklyn & Manhattan bridges, Dumbo has a unique character all its own. In 2007, DUMBO was granted Landmark Status by the NYC Landmarks Preservation Commission. Brooklyn Bridge Park: a 85-acre Park on the Brooklyn side of the East River. The Park has revitalized 1.3 miles of Brooklyn’s Post Industrial waterfront. The views of lower Manhattan make fantastic backdrops for photos. Brooklyn Heights: An affluent residential neighborhood across from lower Manhattan. The cobble stone streets are lined with brownstones & townhouses. The neighborhood features a promenade with great views of the NYC skyline.